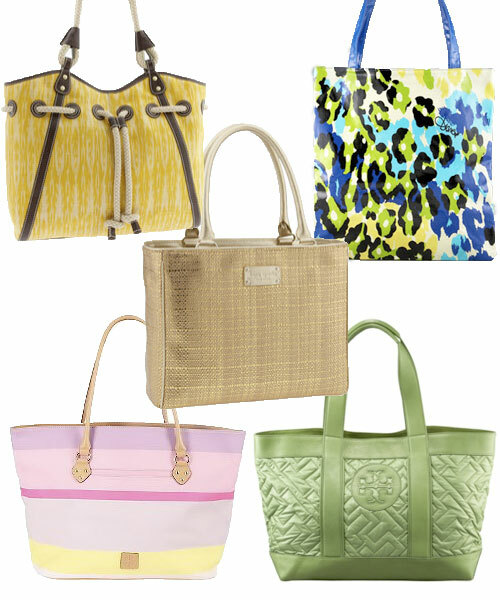 Hit The Beach With A Stylish Summer Tote! For some reason, beach totes have never really excited me in the realm of bag shopping, compared to the endless variety of other styles, that is. Something about them, stereotypically speaking, just gives off a vibe that’s cheap and tacky — basically anything but chic — and something you think of as just an afterthought when you need a carry-all to throw your beach necessities in on your way out the door. However, one glimpse in any department store handbag department has me totally taking back any less-than-fabulous opinions I’ve had on the trend. Bold prints, metallic-woven straw, quilted patterns, rope details and more — this season’s beach totes are updated and ready to make a statement, proving that they’re not only functional for a day at sea, but fun and fashionable to boot! One of my favorites is the Kate Spade Glimmer tote. I love its cute boxy shape, and it looks so luxe with its metallic finish, it’s hard to believe it’s actually made of straw! Then again, tackiness is never something you’d expect from Kate Spade! For a bolder, brighter, more look-at-me statement, I love Diane von Furstenberg’s beach totes, especially the Garden Animal Print tote. And for only $75, it’s a pretty affordable designer addition to your handbag collection! No matter what your preference, you’re bound to find one to suit your beach-going style this season! Save on Summer Beach Totes at Endless.com from TheFind.com’s coupon site.